Santa, Elves & Mexican Food | Weekend in Review. We've had a laid back weekend. The weather has been rather depressing (although nothing compared to being snowed in last week! ), and by the end of the day on Saturday, all 3 of my boys were back with sky high cabin fever. Lord have mercy... this winter seems to be on track to be a long one. Friday we ventured out of the house despite the dreary rainy conditions and braved the roads to go and visit Santa. I'll be honest. I find the Santa pictures with kids crying both hilarious and endearing. 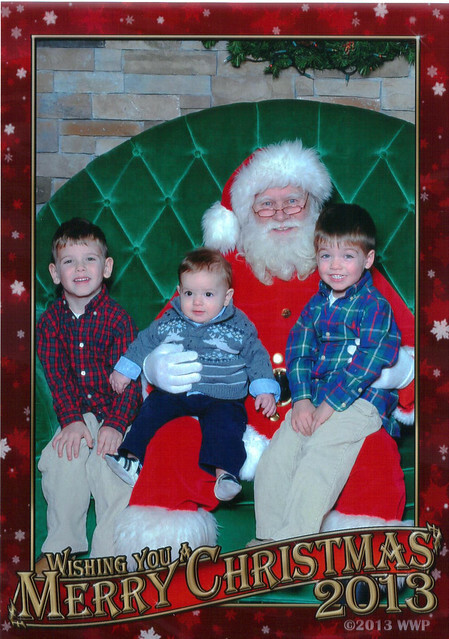 Neither of my other boys have really given me a run for my money when it comes to crying with Santa. We've had close calls, but nothing that really says "I HATE THIS MAN AND NEED TO LEAVE THE PREMISES NOOOOWWW." I blame that on their uber social personalities. I was crossing my fingers that Ty would be freaked just a little, but after a short stare fest with the jolly old man, Ty looked over at the camera and smiled. Friday night I realized that I had an expiring coupon for a local yogurt place. 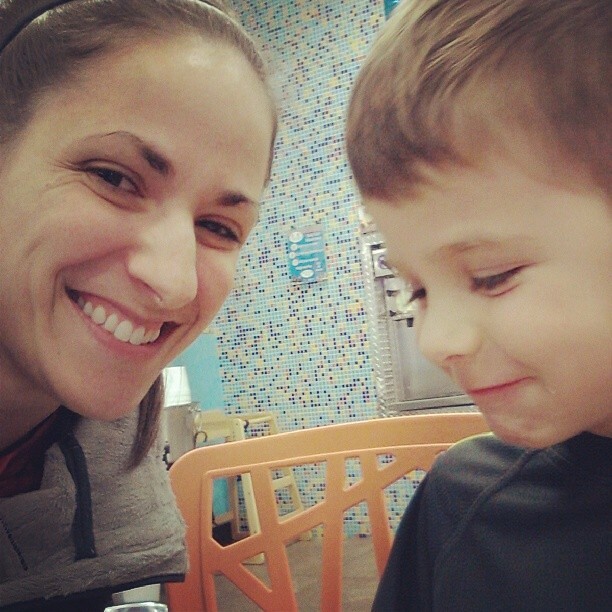 So I took Brayden on a little yogurt date. I let him pick everything. 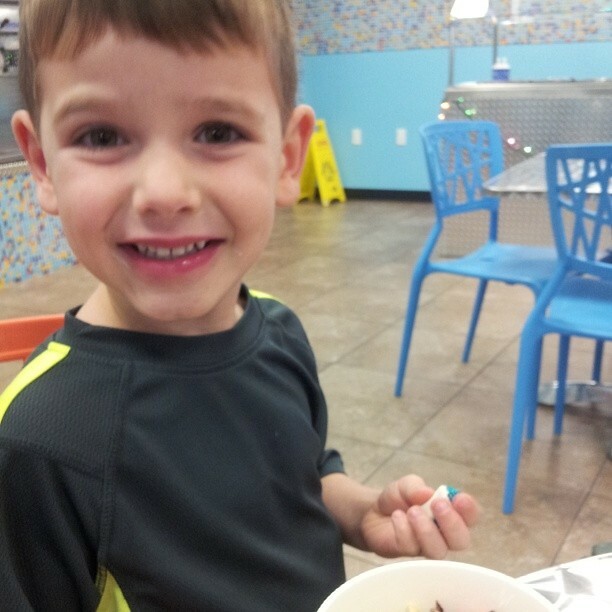 He picked candy cane/chocolate swirl yogurt, fruit loops, gummies, candy corn & a bit of hot fudge. I'm thinking he may be part Elf, as he covered all 4 elf food groups rather well. Unfortunately Brayden woke up with an upset stomach on Saturday morning, so all of our previously made plans went out the window. I was sad that my big guy was sick, but I relished in the fact that Brayden is now of the age that when he's sick he'll actually take advantage of the down time, and sit on the couch and just watch TV. We snuggled for most of the morning watching Netflix shows. This confirms my thoughts that 4.5/5 years of age is one of my favorite phases with kids, second only to the newborn phase. Thankfully Brayden was better rather quickly, and so far, no one else has come down with anything... fingers crossed it stays that way. 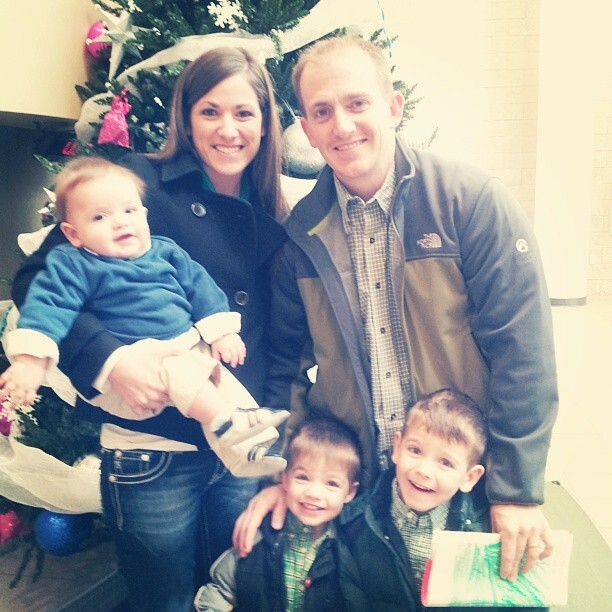 Sunday we headed to church, along with what seemed like the rest of Northwest Arkansas. People were lining the walls of our church it was so crowded... not a single empty seat in the building. Such a good problem to have, and I am so grateful to attend a church that has overcrowding issues, as inconvenient as they sometimes can be. We ran into some of our friends after the service, and I had the capacity of mind to ask them to snap a picture of our family. Not very often are all 5 of us are smiling AND looking at the camera simultaneously. This evening Drew, on a whim, suggested that we go eat Mexican food. If you have children, then you know that this is similar to playing Russian roulette when you have kids. They're either all really good, or all really bad. And if they're bad, it can be epically bad. Thankfully all 3 boys did so well, and Tyler decided he'd try some Mexican food and was about the happiest baby I'd ever seen. Apparently my love for Mexican food during pregnancy has paid off; all 3 of my boys get gleefully happy whenever we eat chips, salsa and fajitas. Also, it should be noted that once Tyler can actually eat more "real" food, we'll have to order THREE orders of fajitas. My boys can split almost an entire order of adult fajitas by themselves. Lord have mercy on us when they're teenagers. We've got a busy week ahead with Christmas parties, a certain someone turning SEVEN MONTHS OLD, and Drew and I celebrating our 10 year anniversary :) We're also going to be celebrating the fact that our temperatures will be back in the 60s this week, before another snow storm hits our area next weekend. Hope y'all have a fabulous week! Dear Drew....10 Years of Marriage.